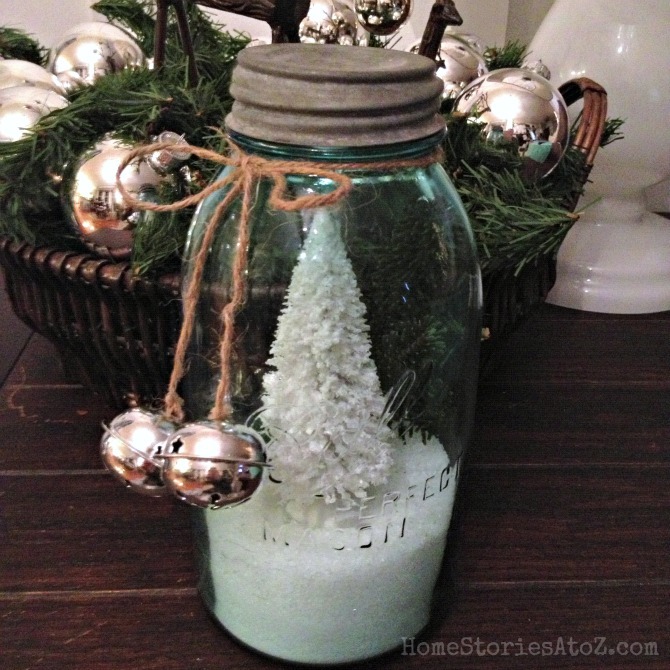 If you want to attach the tree to the lid and flip it upside down like a snow globe, you can do that too! My bottle brush trees came from the Dollartree last year. I’m not sure if they still carry them or not, but I’ve seen so many items from last year in the Dollartrees this year that it’s worth a look. The silver bells are definitely at Dollartree this year and come in a pack of 9 for $1. 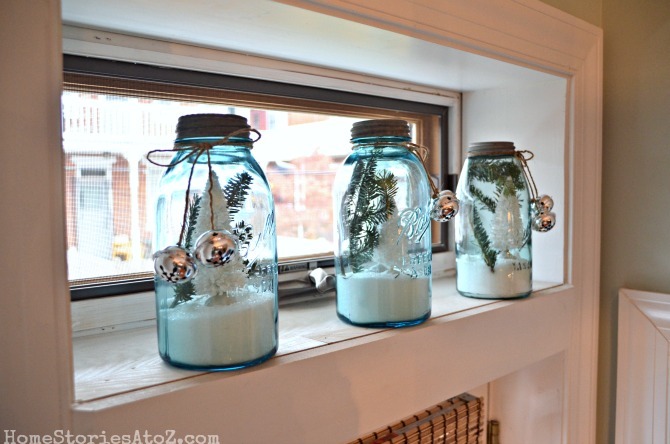 My vintage Ball jars were a Craigslist find. I usually display them empty in my kitchen transom window, but I have to say they look so much cuter Christmasfied. If you want to see all the decorating sneak peeks FIRST, be sure to follow me on Instagram and Facebook :). 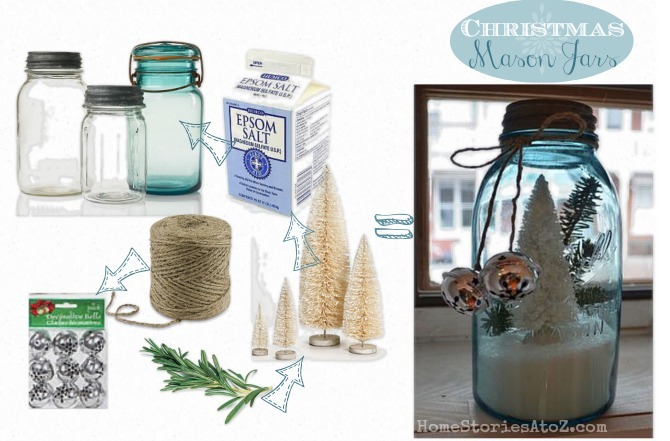 I really love mason jars and this is such a great idea. I would love to try this. Also liked the idea of finding them on craigslist. Never thought of that. 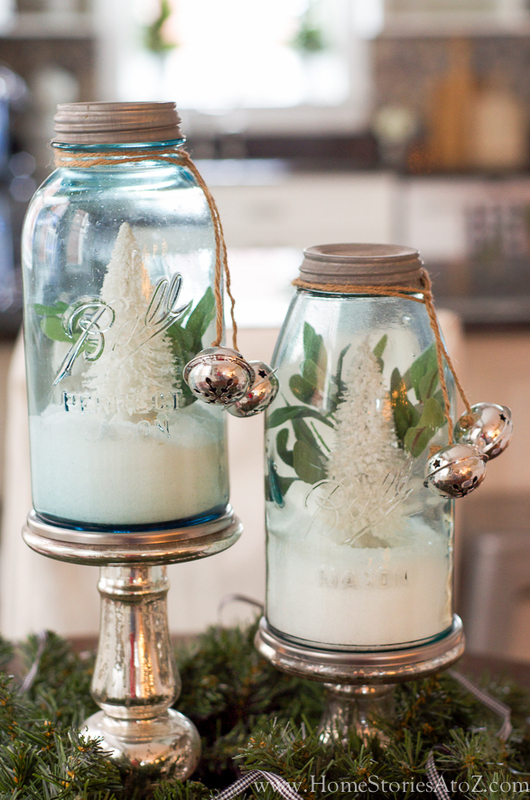 These are so beautiful, Beth–love the vintage blue jars, and those bottle brush trees are the perfect accent. I will have to check out our Dollar Tree and see if they have any. 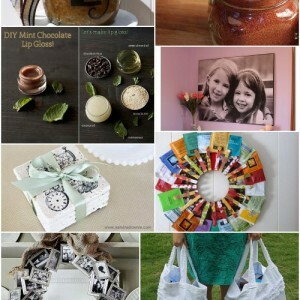 Cute for vintage jars! I think I will do one with a polar bear ornament inside for my neighbor who loves polar bears! Did those trees come white or did you bleach them? I love the idea of a polar bear ornament inside! And yes, the trees came white. 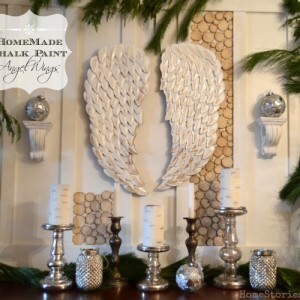 Beth, wish I had a place for some of these in my home….I’ve been adoring all of the variations for a while and the bells on yours are the perfect touch. Now, hurry, hurry we all want to see more! 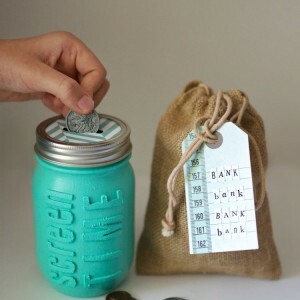 What a really cute idea. I can’t wait to try this. I’ve been eyeing these in various catalogs for a few months now. Yours are cute love the bells! I’ll be making mine soon!